In East London I have always thought that the old red bricks gave a sense of character and identity to the area. 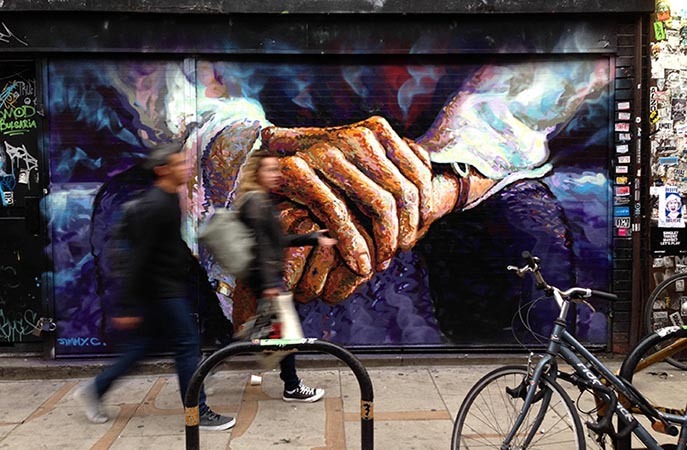 In Shoreditch the grit of the old brick structures seems to set a perfect backdrop for the graffitied walls, street art, and artist studios. However through the gentrification process the brick structures are being demolished and replaced by the reflective new surfaces of high rise developments and luxury apartments. I had already painted quite a few walls on the street in this area and my paintings were disappearing not from people painting over them but from the walls themselves being demolished and replaced. The London brick is seemingly becoming an ever more rare and precious material. 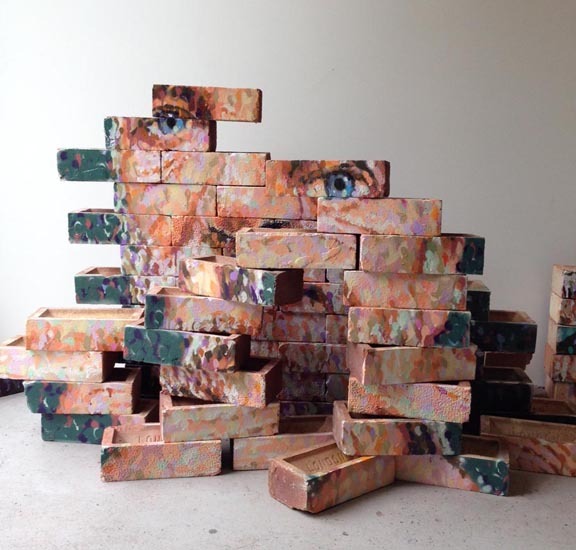 In this series of work I used bricks to refer to the idea of fragmentation and loss of identity. The subject in this work is Mick Taylor who I had first met in Brick Lane. 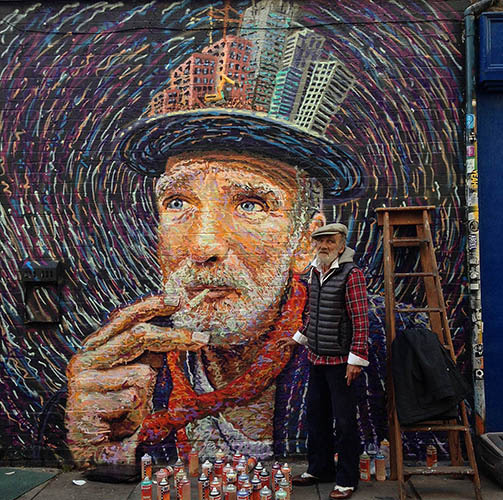 I found him to be an inspiring character with a sense of kindness to his expression and for the colourful outfits that he wore each day. 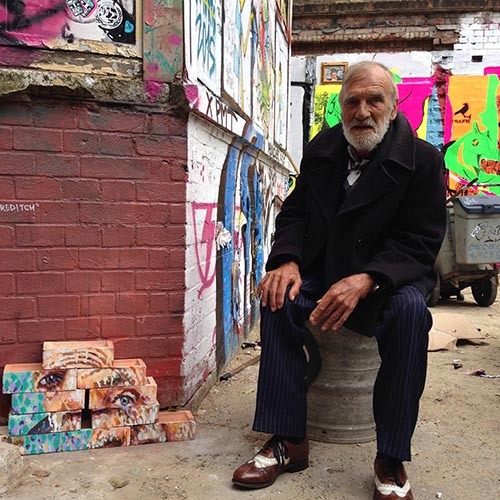 He has lived in Shoreditch for over 50 years and so has witnessed first hand many of the changes to the area. 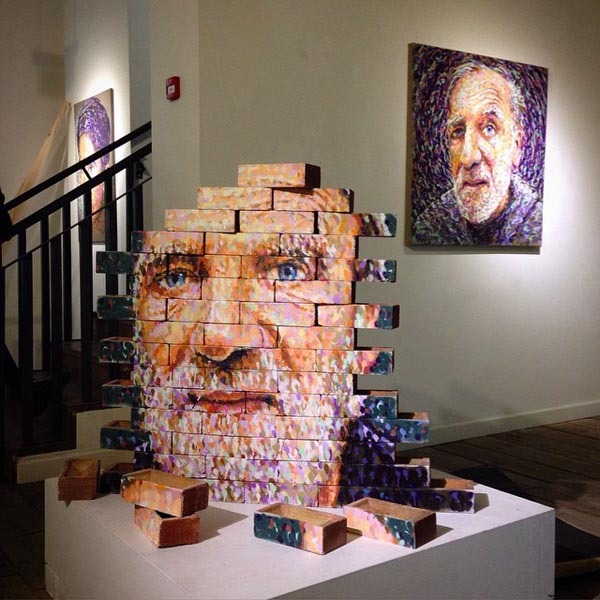 I painted a portrait of him onto a set of bricks of which I then rearranged into a random collage type sculpture. This was to allude to the idea of a fractured identity and displacement that is happening due to the gentrification process. 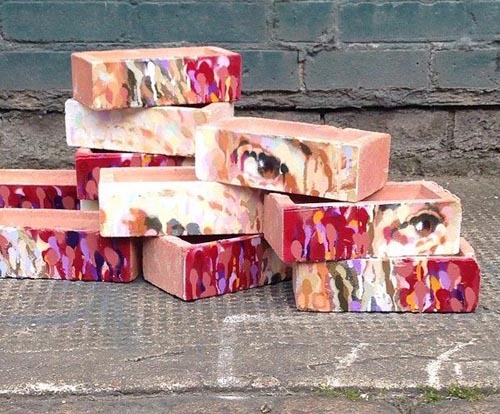 I placed these bricks on the street (just off Brick Lane) and left them awaiting their fate. I accompanied Mick down there to show him the work, here photographed next to the sculpture. The bricks lasted about two weeks before they were taken. 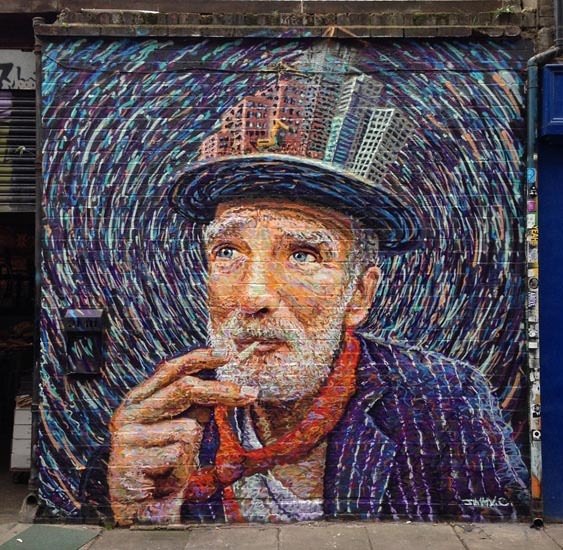 In another work I painted a portrait of Mick just off Brick Lane (2015) on Bacon Street close to where he used to sit for most of the day. I had taken a photograph of him, cigarette in hand and gazing wistfully afar. 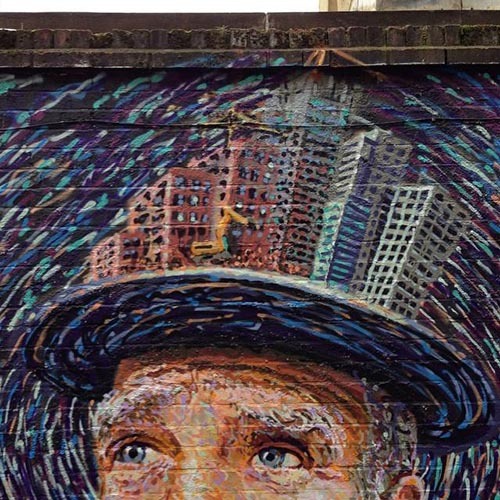 On his head, where a hat could have been, I painted a cityscape which was a literal reflection of the Shoreditch area with the old red brick structures being demolished and bulldozed to give way to the new high rise developments and luxury apartments. In the painting Mick looks outward with a certain lament and amusement as the changes take place before him. 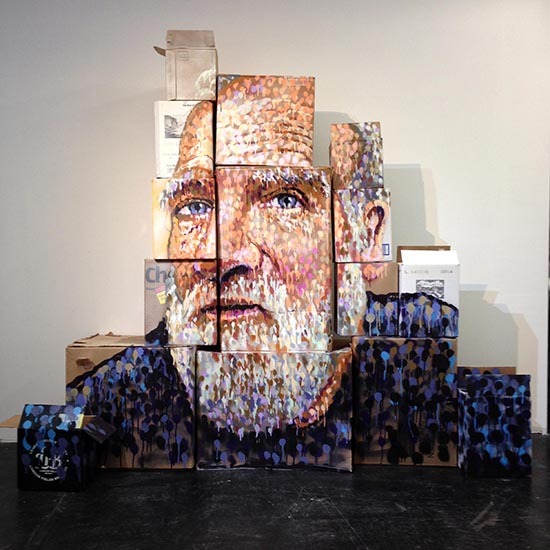 In a more recent work I have taken the concept from the bricks to cardboard boxes. The idea is the same except with cardboard boxes the scale can be larger and the material is a lot lighter to move around. This work was made for a sculpture show at the Unit 5 gallery in East London for February 2017. 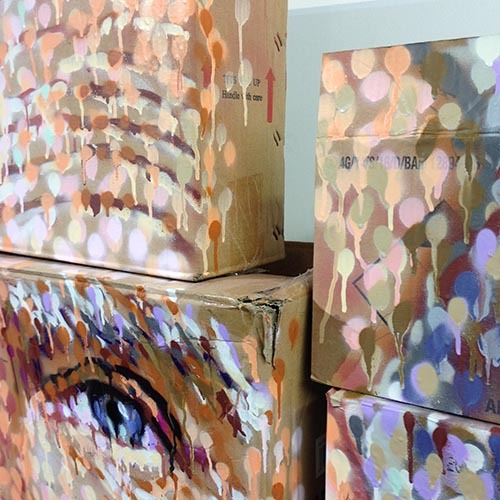 I have made paintings on cardboard before and have always liked this material for its colour and textures with the possibilities to tear or mould the material, often adding to and enhancing the painting itself. Cardboard also has a distinct urban association, often seen stacked up outside shop fronts in the evenings or used by homeless people to sleep on. There is a fragility to this material and even this sculpture could be easily knocked over or reassembled. That same precariousness carries over to individual identity that can be made but also lost within the city. Although there are positive aspects to the gentrification and development of the area, which many would consider as a sign of progress, there are also things that are lost in this process. Artists like myself will be forced out of the area due to the increase in rent. Small business and other creative communities will also be affected and forced to move or close down due to the steep rise in rates. And so the cycle continues - all the artists who helped build the cultural fabric of the area when it was an undesirable area to live will have to move out further to find areas where they can afford to have a studio and work. I am not sure what will happen to the locals such as Mick. I can only hope that a sense of individual character and colour will be preserved and not lost to the expanding city. 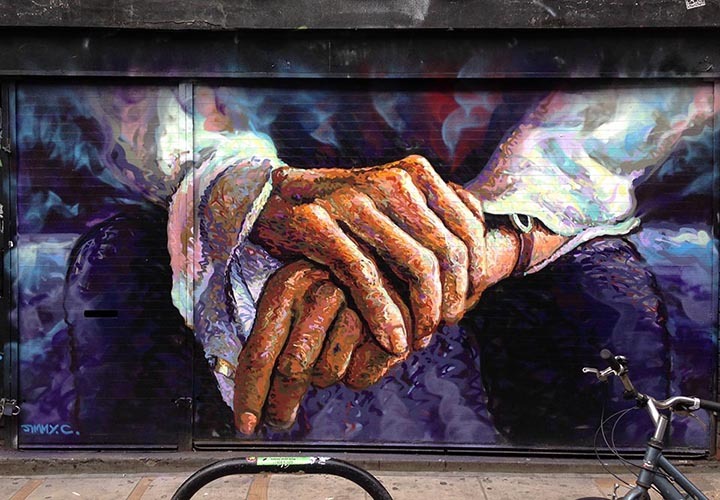 This is a painting that I did in September 2017 in Brick Lane, which was inspired by the hands of Mick Taylor. 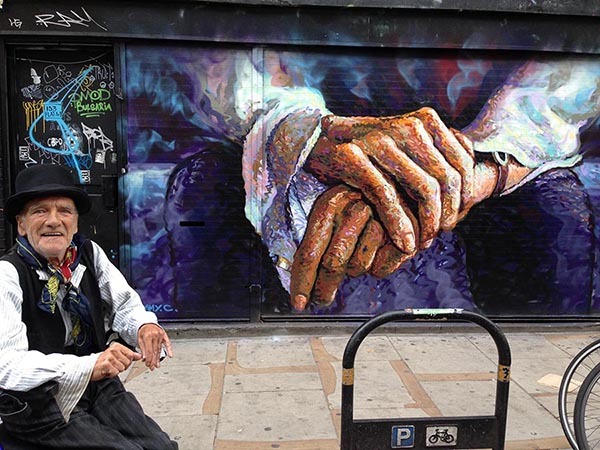 I had been visiting Mick at his appartment in Whitechapel with my friend Hugh, and as he sat on his bed breathing a little more akwardly than usual, I noticed the great character to his hands as he held them there in front of him, the end of a rolled cigarette dangling between the thumb and finger. I asked Hugh to take a photograph, which would become the source image for this painting. I had been told that Mick's health was in decline, which is why I wanted to paint a portrait of him whilst he was still around. 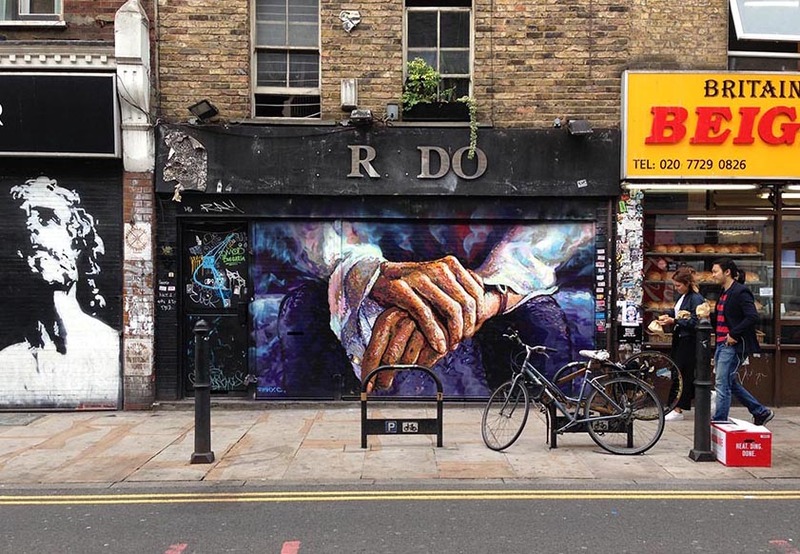 I had originally intended to paint a portrait of his face, but when at the last minute I was offered a wall on Brick Lane, near the Beigel shop, exactly where Mick liked to dwell, I decided to go for the hands painting, which fitted well with the format of the wall. (Thank you Steve from Monty's Bar for suggesting the wall). Mick was pleased that I was painting his hands and whilst I worked on the painting he was there at my side enjoying every moment of it. 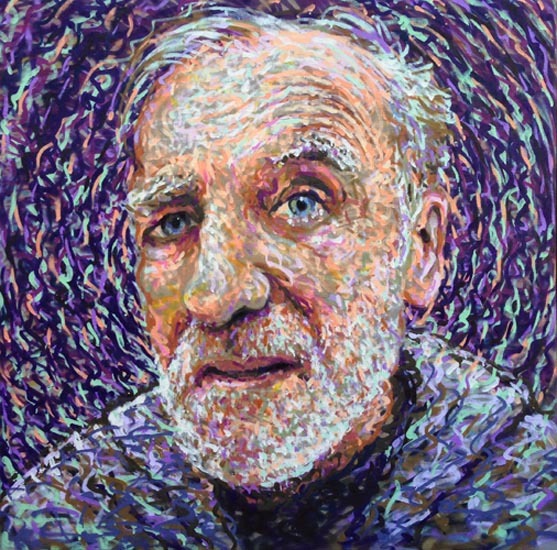 Hugh told me that when he was in hospital before he died, he was still chatting excitedly to the nurses about this painting. I was happy that he had been albe to enjoy the work. 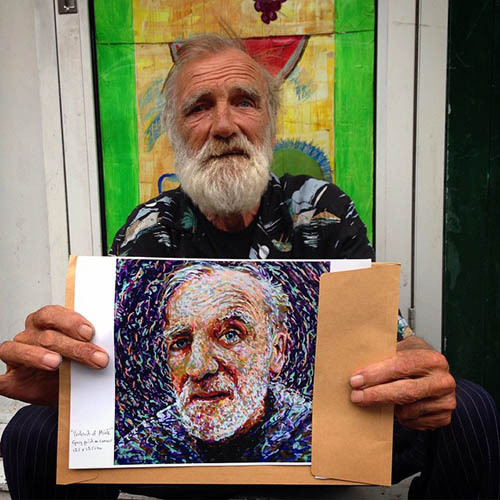 Mick passed away in late September 2017, which was a sad loss to all those who knew him, and an overall loss to Brick Lane. My painting still remains for now, a tribute to a wonderful man who had witnessed the transformations of the area before him. 'Be lucky! ', he would always say to me. Thank you Mick. You will be missed but not forgotten, and your presence and memory will remain with us in the Lane.